At G4 Kegs, we work with clients across the globe — with a vast and diverse set of keg requirements. One of the questions we receive most often is: How many kegs do I need? After all, you don't want to be left with too many kegs that sit empty, or not enough when your busy season hits. While this may seem simple at first glance, you’d be surprised how often companies get it wrong. A number of factors must be taken into consideration — including the nature of your distribution, kegging vs. bottling, whether you plan to have a tasting room, etc. 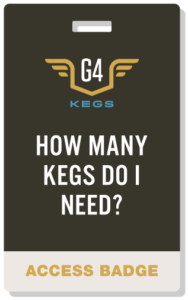 Fortunately, G4 Kegs is here to help you elevate your brewing operation — which is why we've compiled some best practices to help address this fundamental topic, regardless of your business size. Check out our interactive keg calculator worksheet to learn how to build your fleet effectively.